SNL Gives Us the Gift of a President Trump-Less WorldAll Hillary had to do was visit Wisconsin once. What We Know About the Bombs Sent to Clinton, Obama, CNN, Biden, and OthersPolice have arrested a suspect in connection with the mail bombs. Here’s everyone he’s allegedly targeted, and how. Robert De Niro Mailed Suspicious Package Similar to Clinton, Obama BombsA suspicious device was mailed to his Tribeca offices. Pipe Bomb Reportedly Sent to Robert De NiroHe’s the latest person to be targeted with an explosive device in the mail. Robert De Niro in Talks to Join DC Universe for Joker MovieYou’re good, you. What Did Robert De Niro Say That Got Censored at the Tonys?Depending on how you watched Sunday night’s show, you might not have heard it at all. 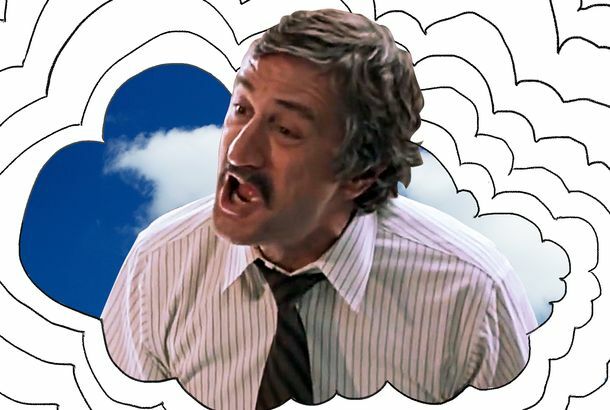 I Think About This a Lot: Robert De Niro Yelling ‘You Blew It!’ in Cop LandIt is the greatest line reading in the history of cinema. The Weinstein Company Is Being Sued for Millions Over Canceled Amazon SeriesA high-profile project from David O. Russell was scrapped because of its connections to the embattled studio. Robert De Niro and Michelle Pfeiffer on Madoff and Life Under TrumpTheir new HBO movie, The Wizard of Lies, is out this weekend. Robert De Niro Learns Snapchat Like the Most Patient GrandpaYes, he uses the dog filter. Robert De Niro Pleads Guilty in HBO’s Bernie Madoff Movie Wizard of LiesDe Niro gets grilled by his granddaughter over his Wall Street wizardry. The Most Memorable Image From a New Martin Scorsese ExhibitThis Cape Fear continuity photo reminds the viewer of the intensity of Robert De Niro’s performance and of the iconic collaboration that produced it. The Comedian Is a Stale Comedy That’s Less Brave Than It ThinksTaylor Hackford’s middle-aged fantasy plays it safe. Wizard of Lies Trailer: See De Niro As MadoffIt’s like The Wizard of Oz … except one million times more devastating. De Niro Will Be Young Again in The IrishmanThe effect might be similar to Carrie Fisher in Rogue One. De Niro Takes the Stage in The Comedian Trailer The movie premieres December 2, and January 13 in wide release. Ellen to Receive Presidential Medal of FreedomThey’ll be honored alongside your dad, Tom Hanks, and many more very cool people. Robert De Niro Describes That Post-Trump FeelingThe actor reacts to the election. David O. Russell’s TV Series Coming to AmazonIt’s been picked up for two eight-episode seasons. Jimmy Fallon Wants to Boat With Robert De NiroOr take an RV trip. 7 Things to Know About Scorsese’s The IrishmanIt hasn’t entered production yet, but it’s already hotly anticipated. David O. Russell Developing Star-Studded TV ShowThis is going to cost some network a lot of money. See Robert De Niro in the Hands of Stone TrailerAlso starring Édgar Ramirez as Duran and Usher as Sugar Ray Leonard. Watch the Hands of Stone TrailerEdgar Ramirez stars as legendary Panamanian boxer Roberto Durán. Robert De Niro, Tech Guru, Explains VRDe Niro discussed his fake time in solitary on Fallon. Robert De Niro Is Doing Stand-up in NYC TomorrowWith jokes by Jeff Ross. Michael Mann’s Imprint to Develop Heat PrequelMichael Mann Books will develop a prequel to the 1995 Al Pacino–Robert De Niro thriller. Martin Scorsese Did a Robert De Niro ImpressionIt was from Goodfellas, obviously. Watch Zac Efron in Dirty Grandpa ClipCool emoji.